Rio Grande’s Payten Davis, left, sets to send a shot past Midway goal keeper Rebekah McKee during the first half of an Oct. 27 River States Conference women’s soccer match in Midway, Ky.
MIDDLETOWN, Ohio — University of Rio Grande sophomore forward Payten Davis collected two big pieces of hardware on Saturday after being named the 2018 River States Conference Women’s Soccer Offensive Player of the Year, as well as the league’s overall Player of the Year. Conference officials announced the All-RSC first and second team selections, as well as the individual award winners – all of which were chosen after a vote by the league’s 10 head coaches. There were 15 honorees on the First Team and 13 on the Second Team. Davis, a native of Chillicothe, Ohio, had a conference-high 17 goals and 37 points in 17 games for the RedStorm, who finished 7-9-2 after a quarterfinal round loss to Indiana University East. Rio Grande also placed junior defender Brooklyn Pritt on the first unit. The Scott Depot, W.Va. native started all 18 games for head coach Tony Daniels’ squad, scoring five goals and handing out five assists. 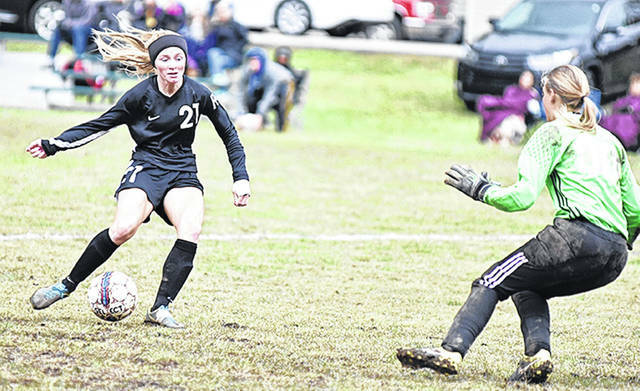 WVU Tech senior Brianna Enger was chosen as RSC Defensive Player of the Year. She led the way on defense for the Golden Bears, who gave up just 13 goals in 14 games for the second-ranked defense in the conference. Point Park (Pa.) University freshman Tia Horew was tabbed RSC Newcomer of the Year. The forward from Pittsburgh, Pa., notched eight goals and 16 points in 14 games and scored four game-winning goals for the Pioneers. Carlow (Pa.) University head coach Allen Duda was voted as RSC Coach of the Year. In his first season, he led the Celtics to a record of 9-8-1 overall, 6-2-1 RSC for the No. 3 seed in the conference playoffs. RSC regular season champion Point Park led the All-RSC First Team with four players selected – Tia Horew (Fr., F), Gabby Widman (Jr., M), Chloe Bowser (Jr., D) and Ashtyn Webb (Jr., GK). Ohio Christian was next with three first-teamers including Brooke Lezotte (Jr., F), Brooke Wilhite (Jr., M) and Rachel Lawwell (Jr., D). In addition to Rio Grande, two schools had two players each on the first team – Anna Canyis (Sr., D) and Carley Pyles (Jr., GK) from Asbury University and WVU Tech’s duo of Maria Gonzalez (Sr., M) and Brianna Enger (Jr., D). Carlow’s Kristina Wallace (Sr., F) and IU East’s Dejhanna O’Bryant (So., M) represented their schools on the first team as well. Carlow and IU East led the All-RSC Second Team with four players each selected. Asbury was next with three players on that list followed by one each from Midway (Ky.) University and Cincinnati Christian University. The River States Conference also named a Women’s Soccer Champions of Character Team, identifying one player from each school who best exhibited the five values of the NAIA Champions of Character, which are respect, responsibility, servant leadership and sportsmanship. Rio Grande’s representative on the list was senior Kelsie Lee (West Chester, OH).